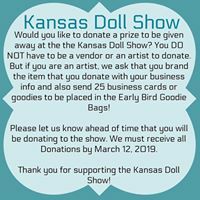 For all artists out there that are wanting to donate something to the Kansas Doll Show giveaway there is still time. To have your item included in the fun please make sure that your donation is received by 12th March. Jenny is amazing at doing this and adding all these extra bits into the event. All these item that are added to the giveaway need to be branded. As well as this Jenny will kindly add your business card to all the goody bags. I think that it is the little extras like this that make the Kansas Doll Show such a huge success. Everyone that attends leaves after having an absolute wonderful time. So if you want to include something to the giveaway or goody bags don’t hang around too long or you may miss your chnance.